⚔ ☢ Serie på 50 underjordiske amerikanske atomvåben og atomvåbenrelaterede forsøg hovedsageligt i Nevada forsøgsområdet i den første del af den kolde krig. Se tillige: Operation Anvil ; Aqueduct ; Arbor ; Argus ; Bedrock ; Bowline ; Buster-Jangle ; Castle ; Chariot ; Charioteer ; Cornerstone ; Cresset ; Crossroads ; Crosstie ; Cue ; Dominic ; Dominic II ; Dugout ; Emery ; Fishbowl ; Flintlock ; Fulcrum ; Fusileer ; Greenhouse ; Grenadier ; Grommet ; Guardian ; Hardtack I ; Hardtack II ; Ivy ; Julin ; Latchkey ; Little Feller ; Mandrel ; Musketeer ; Newsreel ; Niblick ; Nougat ; Phalanx ; Plumbbob ; Praetorian ; Project 56 ; Project 57 ; Project 58 ; Project 58A ; Quicksilver ; Ranger ; Redwing ; Roller Coaster ; Sandstone ; Sculpin ; Storax ; Sunbeam ; Teapot ; Tinderbox ; Toggle ; Touchstone ; Trinity ; Tumbler-Snapper ; Upshot-Knothole ; Whetstone ; Wigwam. 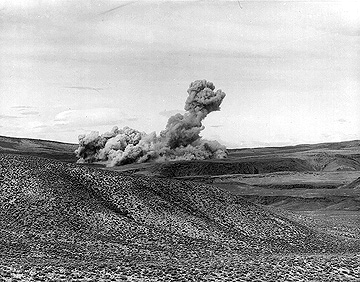 Department of Energy, Nevada Operations Office, Office of Public Affairs and Information: Plowshare Program, udateret, - 41 s.
United States atomvåbenforsøgs, juli 1945 through September 1992.